The Adventures of Scott & Caroline: Lovely, Livable Luang Prabang, I Love You! Lovely, Livable Luang Prabang, I Love You! After a couple of weeks back in Chiang Mai enjoying the relative comforts of our Nimman area condo with full kitchen and pool, we were getting restless; we were ready to move on beyond Thailand and start exploring Laos. 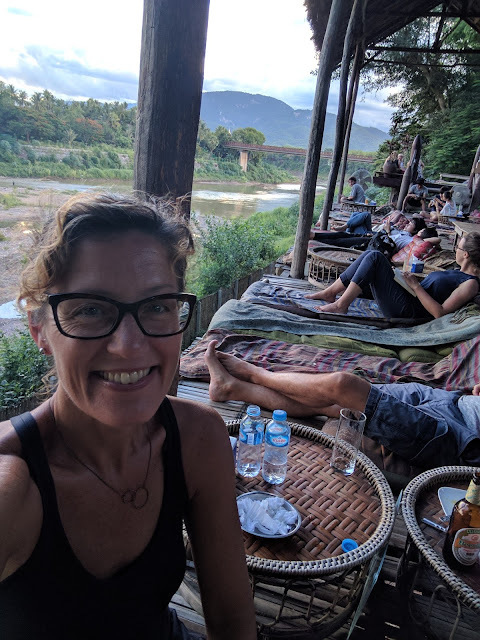 Our (ok, my – Scott’s) original plan had us taking the two-day slow boat from Huay Xai down the Mekong to Luang Prabang, after an overnight (or two) at the Gibbon Experience eco-tourism tree houses. Caroline was not so keen on the tree house lodging scenario, which included hiking and zip-lining in with your stuff to a barebones, electricity-free, toilet-paper-free accommodation (you can bring your own but you must pack it out at the end of your stay), so I was going to do a quick one-nighter and meet her back in Huay Xai for the boat. Unfortunately, June is apparently the worst time to book a boat. There are very few passengers just before the monsoons arrive, and we would have had to wait several days in Huay Xai and pay exorbitant amounts of money for seats to get on a private boat. The public boats, with their relative lack of comfort and dodgy restrooms, did not interest Caroline (theme, lol) for a two day long trip. With the Huay Xai trip not happening, the Gibbon Experience was no longer convenient to anything else on our itinerary. The plans they are a-changing. So it was that we found ourselves on a plane flying over the stunning countryside of northern Laos. 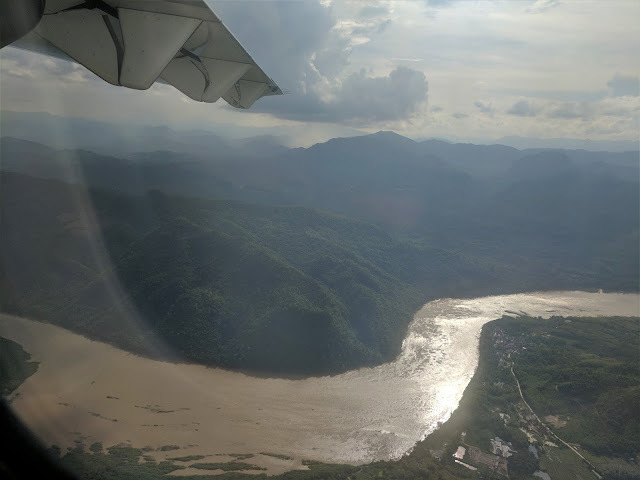 Lush, green, jungle-covered mountains and full rivers below the plane the entire way in to Luang Prabang’s tiny airport. 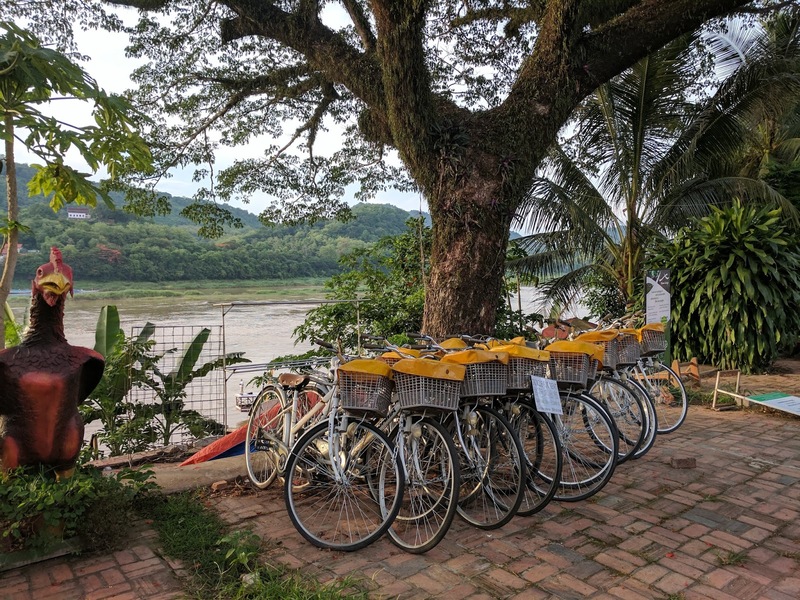 A World UNESCO heritage site, much of Luang Prabang’s scenic and historic old city is situated on a peninsula between the Mekong and Nam Khan rivers, with the confluence of the two at the far northeastern tip. 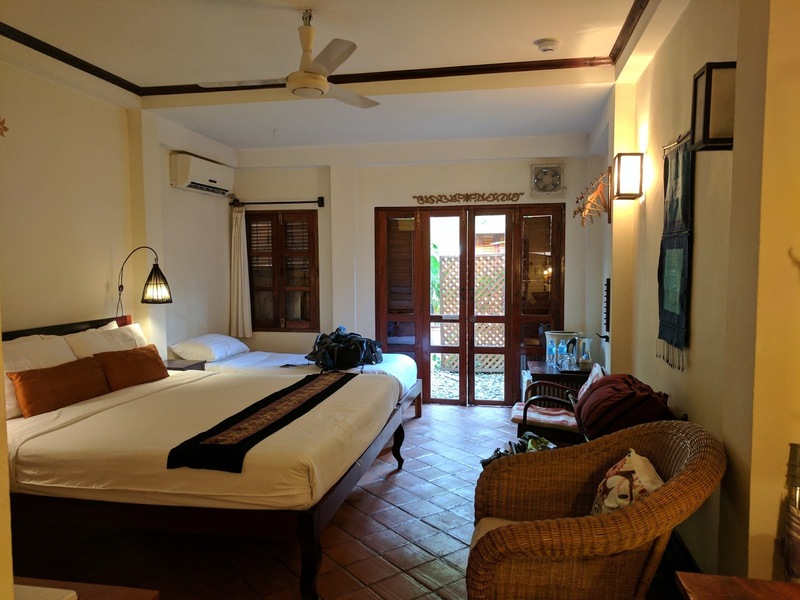 We booked our first three nights at the Lotus Villa Inn, located in a great spot not far from the confluence. 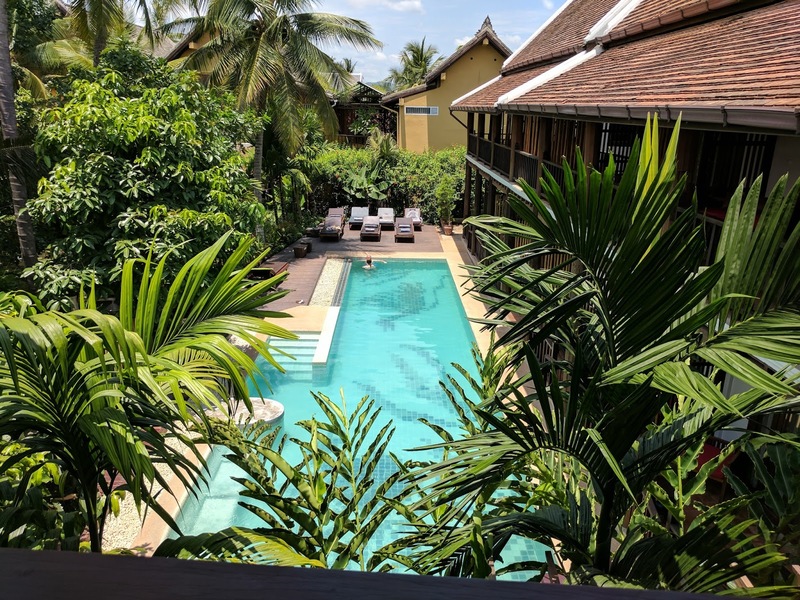 A lovely space with friendly staff, good food, and in a wonderful location – but with a dark, not-so-private room and lacking the pool that many less-conveniently situated properties offer. And it was hot. Really eff-ing hot. 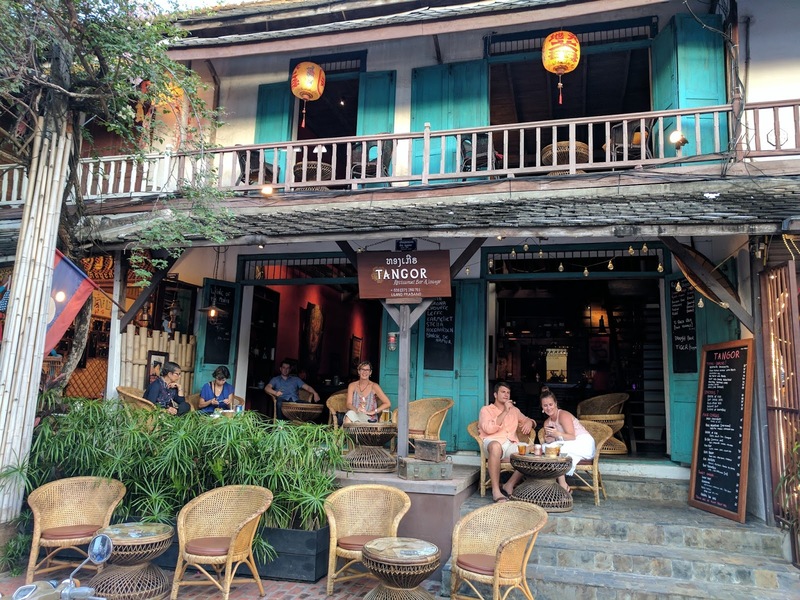 So we spent our first days not just exploring the old town, but since it was clear that Luang Prabang was somewhere we were going to want to spend some quality time, we also used our first days visiting other properties. Much of this exploring we did by bicycle, as most of the hotels offer complimentary but poorly maintained bicycles for their guests, since it’s an easy, flat, quiet town that’s enjoyable to ride around. Having found a new hotel to move into for our 4th through 13th nights (yes, we stayed 2 weeks), the lovely Maison Dalabua, we spent the rest of our time taking advantage of our old town location. 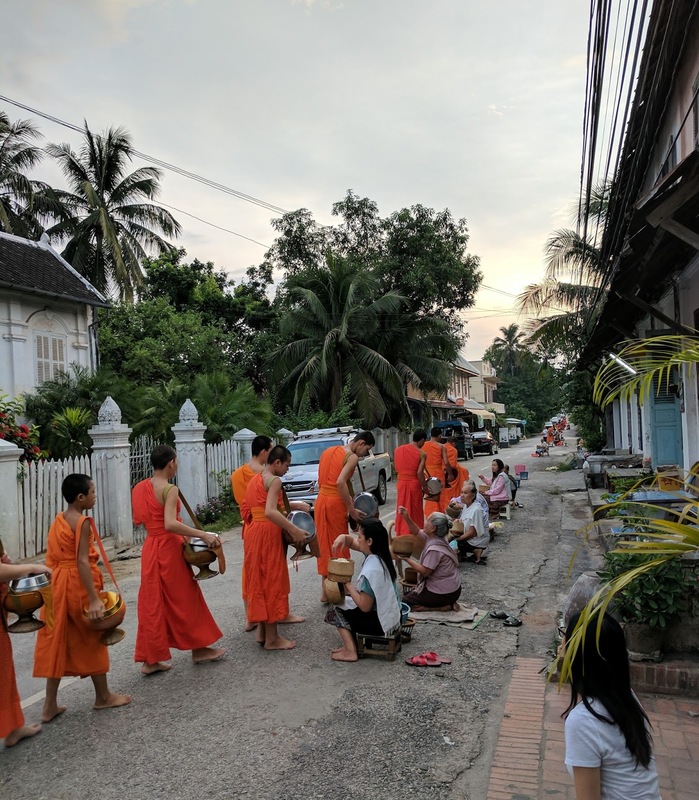 We woke before dawn to sit on our room’s patio to watch the monks collecting their alms from the (mostly elderly) local women, who placed sticky rice in their decorative alms bowls from their sitting/kneeling positions on the street as the monks walked by. We visited the famous Wat Xienthong, covered in impressive, artfully designed glass mosaic murals. 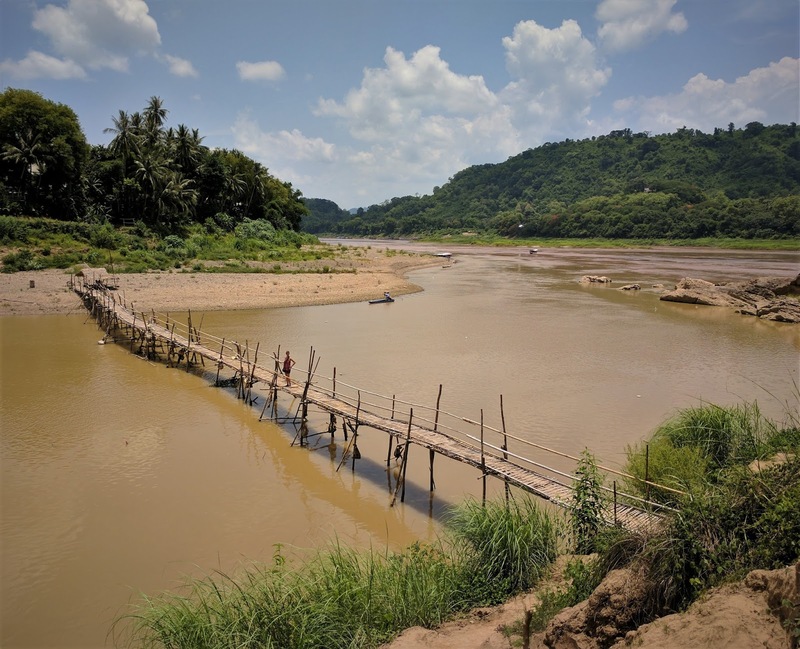 We ventured over the rickety-looking bamboo bridge that crossed the Nam Khan near the Mekong to explore the low-key weaving and paper making “town” on the other side. After bicycling in the heat, we enjoyed sipping lime juices and pastises at the soporific Viewpoint Café. We spent time looking up the word “soporific”, since it’s a favorite of the Lonely Planet authors, and also used in Colin Cotterill’s Dr. Siri mystery novels set in Laos that we’d started reading. 1. tending to induce drowsiness or sleep. Yep, sounds about right for Luang Prabang. Soporific, defined. Another lazy afternoon at the positively addictive Utopia lounge. Having pretty much “seen the town” during our stay at Lotus Villa, by the time we found ourselves at Maison Dalabua a little further out (but still only an easy 15-minute walk into town), we spent more time relaxing, enjoying our beautiful balcony overlooking the pool, and hanging out in said pool during the oppressive heat of the afternoons. Once or twice a day, we’d wander or ride back into town to get lunch, dinner, or just drinks or snacks, at one of many of the charming cafes or bars. We quickly found our favorites, and ended up frequenting Le Banneton bakery & café for lunches, and the charmingly atmospheric French-run Tangor for happy hours, snacks, and one dinner. Tangor quickly became one of Caroline’s favorite spots on earth. Caroline, in her official happy place. French rose, French sauvignon blanc, French waiters and great European food right on Luang Prabang's atmospheric main street. 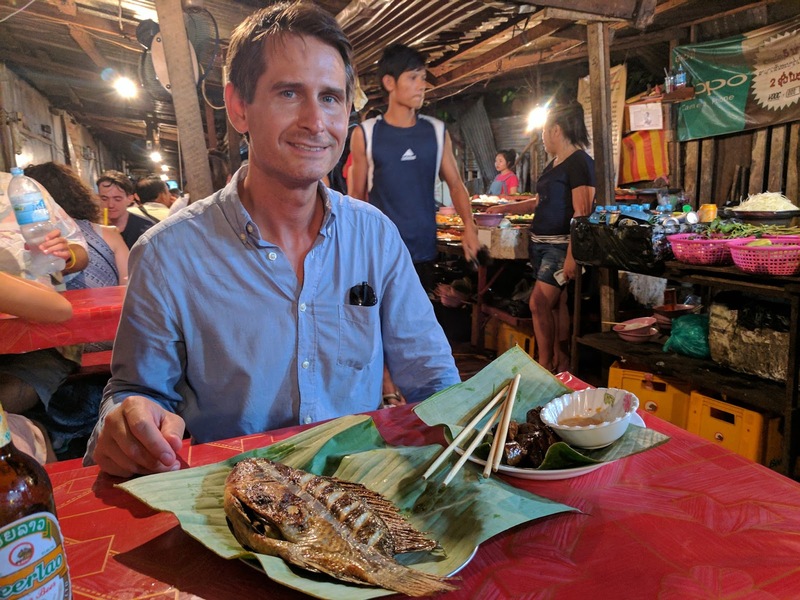 In between Le Banneton and Tangor, we enjoyed some of the best bread-with-herbed-butter ever at the white-tablecloth Blue Lagoon, and had a few grilled whole fish & sticky rice meals at the hot, stuffy and crowded market stalls. Scott enjoyed many a BeerLao, while Caroline had her fair share of rosé and Savvy-B (our adopted moniker for sauvignon blanc, thanks to a cheesy bartender in Queens, NYC). If it sounds like we spent all of our time eating, drinking, or at the pool, that’s because we did. Okay, not all of our time. We did visit the sobering exhibit at the UXO (unexploded ordnance) museum, where we learned much more about America’s secret war in Laos, and the damage done over the last fifty years from both initial bomb runs and the ensuing decades of UXO explosions from simply trying to live on the land where 30% of the 270 million cluster munitions failed to explode when initially dropped. The statistics are upsetting, the ongoing stories extremely sad. For additional details and photos, you can check out Caroline’s post. 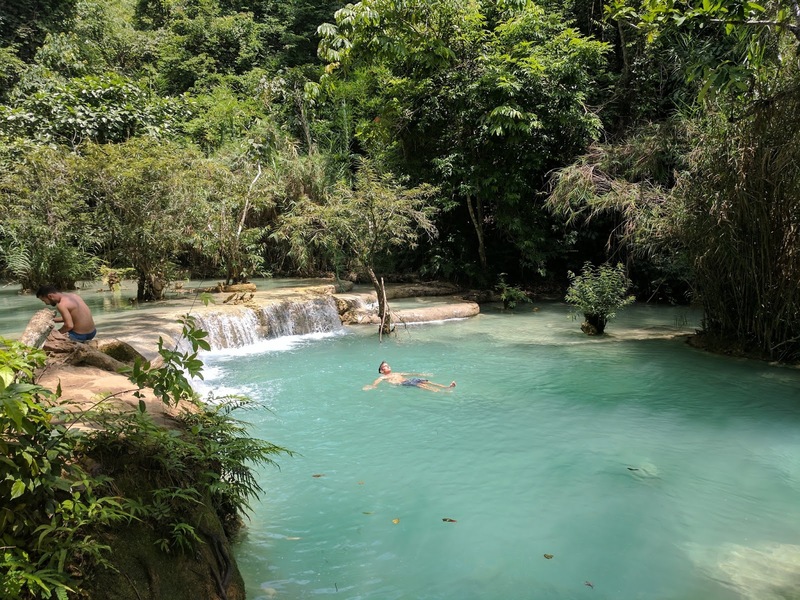 Our other big outing involved renting a motorbike for the day and heading to Kuang Si Falls, one of the top tourist destinations in Laos, located about an hour’s ride south of Luang Prabang. As it is such a popular tourist spot, we set off very early in the morning to make sure we arrived before any tour buses had the opportunity to pull up and let their droves of (probably Chinese) tourists off. The early morning ride was absolutely glorious, and we were thinking that even if the waterfall wasn’t that exciting due to our timing at the end of the dry season/start of the rains (would it be brown? ), it was worth it just for the scenery from our motorbike. We pulled up to a virtually empty parking lot just as the entrance gate was opening, locked up our bike (motorbike theft is a real problem in Laos – often by the company that rented it to you so they can get your deposit money), and wandered in. To get to the falls, you first have to walk through a bear habitat, where bears rescued from poachers and circuses have some space to roam, and which educates the public about the mistreatment of Asian bears that poachers are killing for medicines where better alternatives are available. We walked through quickly, deciding to save our visit for on our way out, so we could get to the falls before the hoards. After the short walk up the trail, we saw the lower pools of the multi-tiered Kuang Si Falls, and they did not disappoint, living up to every bit of the hype. Dazzlingly clear turquoise waters in pools held together by rocks and beautiful foliage, with butterflies flitting about everywhere. This, we decided, is what every luxury resort must be trying to achieve with their fake, Disney-esque swimming pools with waterfalls, bridges, and palms. It seemed too perfect to be real, but indeed this is all pure nature. Taken on our way out of the park, the lower pools at Kuang Si Falls were a little more crowded in the afternoon but no less beautiful! Before diving in (it was still only 9am), we took the hike up to the top of the falls. Hot and humid already, by the time we got to the top we were drenched in sweat. While the views from the top of the falls were not all that, as they are quite wide and tree-lined, and you can’t really “lean over” the edge, it was very peaceful and beautiful at the top as well. 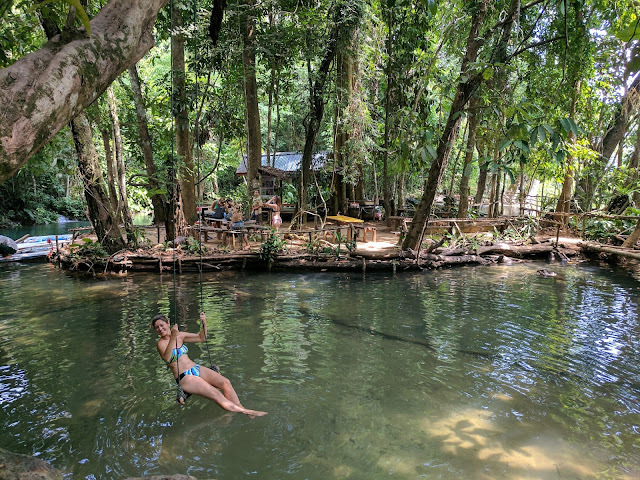 The pools at the top were chilly, but inviting in our sweaty state, and we enjoyed a bit of time floating around and posing for each other on the tree swing with hardly anyone else around. But we were both anxious to get back down to the bottom, where we had a choice of five or so large and much more colorful pools created from the cascading falls. We dove in, took thousands of photos, and couldn’t believe this was our life – the perfect paradise. 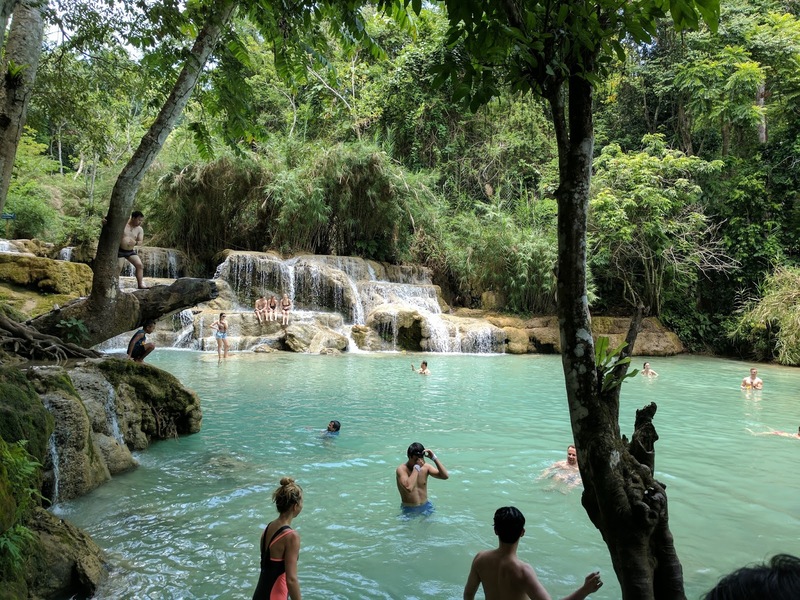 Kuang Si Falls - happily, we enjoyed a dip in the refreshingly cool waterfall pools before the afternoon tour bus crush! We could have stayed all day. We talked about coming back. But, alas, we had to get back to our boutique hotel’s swimming pool and happy hour at Tangor. Such are the hardships of life. Speaking of hardships, we did encounter one minor hiccup on the way back to LP, when we got a flat on our rear tire. It was, once again, really eff-ing hot, and we seemed to be in the middle of nowhere. So I started pushing the motorbike down the road, where after a couple of kilometers we came across a town. All towns in Southeast Asia, no matter how small, have a motorbike repair shop, and this was no exception. A friendly young mechanic took five minutes or so to replace our tube, inexpensively at that, and we were quickly on our way. Not a big deal. The other way we spent our time in Luang Prabang was planning next steps. 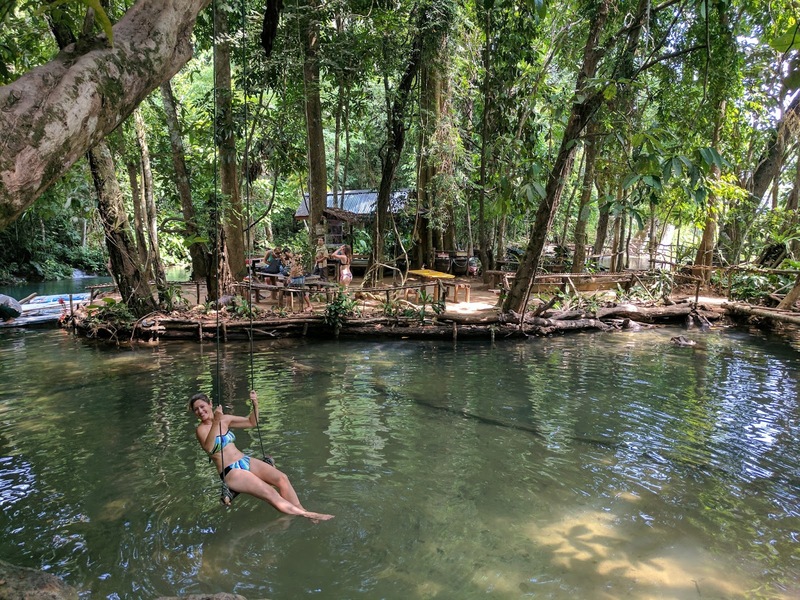 We came up with a reasonable itinerary, and picked some accommodations for our next stops – first in Nong Kiauw, which is located up-river from LP, then down to the country’s somewhat sleepy-sounding capital of Vientiane. Both seem to promise soporific times to come.